For many professionals, the most difficult job to get is the first one. Depending on the area, entry-level jobs can be hard to find, and some require so much experience that it’s not even fair to call them “entry-level” in the first place. That’s why we took a deep look into iHire’s hiring data to find the hottest job markets and best cities for entry-level jobs. We started by looking at the best job markets in 2019 and then calculated the number of entry-level opportunities in each major city and metropolitan area. 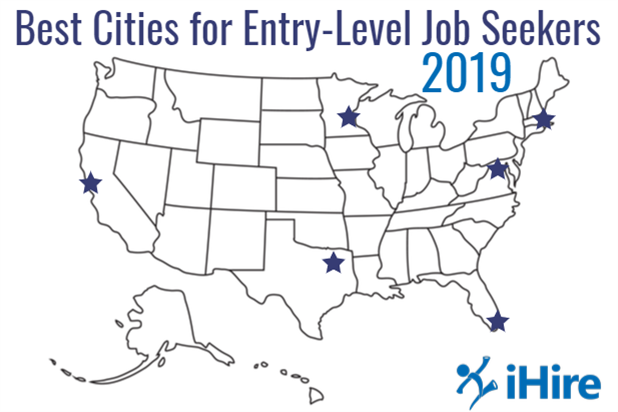 From there, we identified the total number of entry-level job seekers in those areas to gauge competition levels and combined that data with other factors including unemployment rate and cost of living to arrive at our list of the best cities for entry-level jobs. Boston earned the top spot because it’s one of the best cities for jobs, period. With a 3.2% unemployment rate, Beantown offers the hottest job market on this list and more than 4,300 opportunities for entry-level job seekers. However, Boston’s cost of living is on the high side, which may be why there isn’t a lot of competition for entry-level jobs at less than two candidates for each opportunity. The Minneapolis job market has been heating up for years, and although other cities may have a higher volume of opportunities for entry-level job seekers, they can’t match Minneapolis’s combination of low unemployment rate (3.6%), low cost of living, and low competition. Based on pure volume, Washington, DC is the hottest job market for entry-level professionals on this list. However, there are two candidates for each of the 4,930 job openings. That statistic combined with an average unemployment rate (3.7%) and high cost of living knocked the Nation’s Capital down a couple rungs to number three. Miami might be one of the more glamorous locales for entry-level job seekers, but that wasn’t enough to make it the top city in this group. There’s also a healthy amount of competition for each of the 3,256 entry-level jobs in the southern portion of the Sunshine state. That, combined with a 3.8% unemployment rate and high cost of living, put Miami at number four. With more than 4,700 jobs and the lowest cost of living of any city on this list, you’d think Dallas would be higher than fifth. However, the unemployment rate in Dallas is above the national average at 3.9% and there are almost two candidates competing for every entry-level job opening. San Francisco offers the lowest unemployment rate of any of the cities on our list, but the Bay Area also boasts the highest cost of living and the most competition with almost three candidates battling for each of the 3,750 entry-level job openings. If you’re searching for the best place to start your career, let iHire help you find great opportunities in your town or across the US. * Number of jobs and job seekers calculated as of 4/9/2019.